I got this quilt back from a shop last week and fell in love with it all over. The quilting is a-maz-ing. I made this out of 2 (ish) layer cakes of Summer House by Moda with the Kaleidoscope pattern. I made the quilt top last spring…then told my local quilter she could do whatever she wanted on it…which I always do…because she’s amazing and I can’t ever decide. The back is a pop of color. I really love it…just what I need when its brown and pretty darn ugly outside. the roller coaster set up in my living room. The best $94 Santa ever spent…even if it is loud and I have to step over it everyday…best…toy…ever. I love unedited pics, I do it on my blog too. Great, colourful quilt. Just the antedote to a grey winter's day. I'm wanting to make a string quilt using this pattern, so you had fantastic timing! Thanks! that is SO gorgeous!!! i gave up on editing toys out of my images, ha! with 5 kids, there's always a little person, juicebox, or toy in the background. Your quilt is bee-you-tee-ful! And, had I known about the roller coaster, it would have definitely been under our tree this year! Love the colors of your quilt. Have never seen that toy, looks like it would be fun. The toy looks great fun. Beautiful! And what a lucky young person to have their own roller coaster!!! I totally agree with you on the roller coaster toy. My kids are 22, 19, 18 and 15. We got it when the 19 and 18 year old were 1 and 2. It was in my kitchen. We moved to another state and it went out in the yard. As they got older, it was used for all sorts of stuff including a skateboard launcher for teens. It's now handed down to my 2 and 5 yr old niece and nephew and it looks and works as well as it did 18 yrs ago! I'd highly recommend it! I love the quilt!! I have some Summer House for a Basket Case quilt as soon as I work up the nerve to cut it! We also have a roller coaster and it is truly wonderful; best toy until…..Santa brought a plasma car!! My children rode them Every Single Day for over two years and still ride them often. Santa was brilliant that year! Love the quilt! The bright colors are fantastic. Roller coaster! I wonder if it would keep the cats entertained? The quilt is beautiful. Oh. My. Word. So colorful and amazing and sigh inducing awesomeness. I loooooove this pattern so much! well, all of your patterns… they come together so quickly and easily! I made 2 kaleidoscopes this past year, the Christmas one was so cute! That is a beautiful quilt! I love how bright the colors are too! Love the quilt and the quilting is gorgeous. How much extra on the sides (batting and backing) does your quilter like to have? I'm thinking of getting a couple done myself. I know every quilter is different but I"m just curious. Thanks, Allison! Have you tried stomp rockets yet? 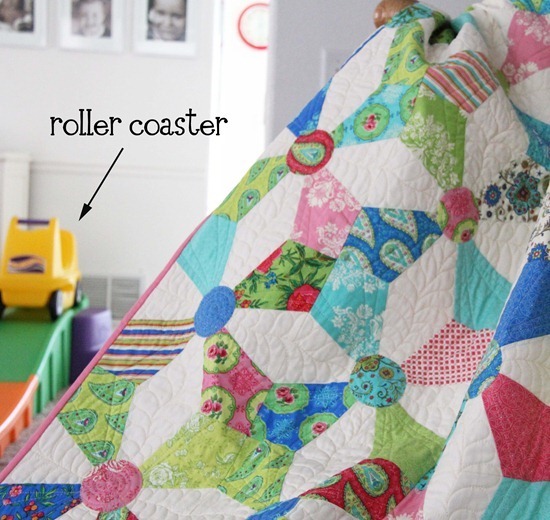 Love the quilt, but I have to tell you that I got that roller coaster at a garage sale about 11 years ago for $5 and my grandkids have all had a great time with it. They keep passing it down to the younger ones. The quilt is beautiful. Your work is amazing. My goal is to make quilts half as nice as yours. Love it. Beautiful! It looks like spring has come early this year! Lovely colours. I love it, so nice and bright! Lovely quilt. Love the bright colors. I feel the same way about the roller coaster as with Legos at my house. The roller coaster was our favorite toy too. My kids are 24, 20 and 15 so the toys are soo much more expensive! I am glad to hear that they are still making the roller coaster I don't know what happened to ours but we will be buying another one if we ever have grandchildren. I love the quilt have been wanting to buy that pattern and this has pushed me over the edge. That quilt is beautiful! I wonder why I haven't seen summer house in the stores? I love reading your posts! You makes me smile with your wit. The quilt is fabulous too! I have to add it to my ever-growing to-do list. What an amazing quilt and the colors are perfect together! that is one of the loveliest quilts ever, so pretty and fresh stunning! Oh and the rollercoaster is cool too! 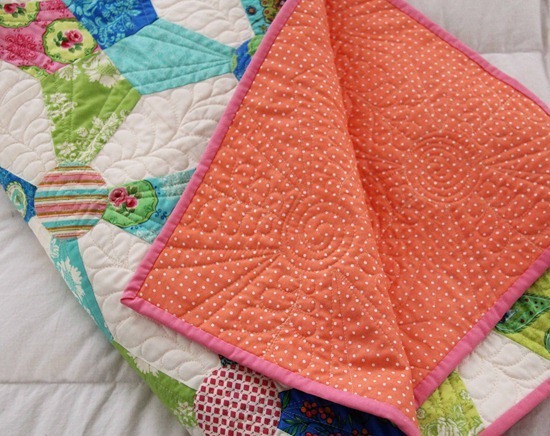 Love the bright and cheery colors in this quilt! The rollercoaster looks fun. P.S. Mennikelly's comment above about stomp rockets–they are WAY cool! Highly recommended. I love this quilt and the unedited photo. I love this quilt. I have been staring at your Kaleidoscope pattern for over a year now and I think it is time to take the plunge! ooh it's so cute! i love it! and i've always loved that fabric. i want to make that pattern sometime. gosh i feel so lazy lately. not accomplishing much. thanks for inspiring me. 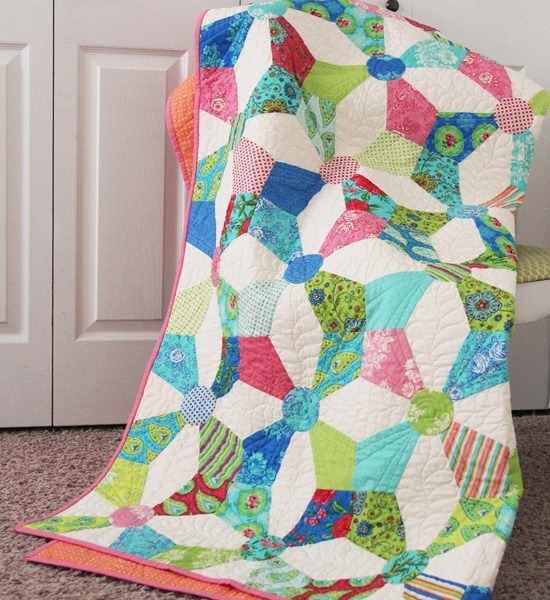 Love this quilt…color inspiration here! Thank you for your tutorials and amazing inspiration on your blog! 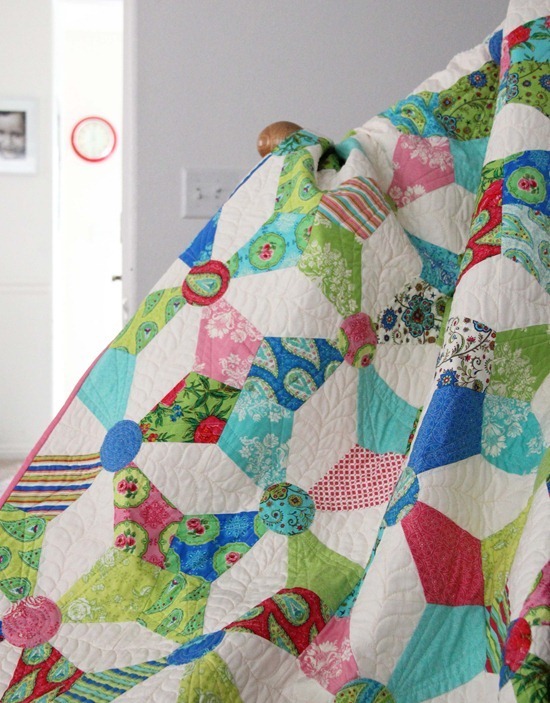 I just love the colours of your quilt … it is sooo fresh & modern. You have inspired me to start my own kalleidoscope quilt … Thnks. PS. Just love your blog! Have I mentioned how much I enjoy your site because of your use of color. Love the way you put it together. Can you tell me who you send your quilts to, to finish them? I live in California and we do not have anyone out here hat does that! I would love to get my tops finished! I love your quilt it is so pretty and you did such a good job.